June 19, 2012 by Ken Ward Jr.
New federal legislation was introduced today that seeks a moratorium on new mountaintop removal permits and demands that the federal government examine the growing scientific evidence that residents living near these mining operations are at greater risk of serious health problems, including cancer and birth defects. Thirteen Members of Congress led by Representatives Dennis Kucinich (D-OH) and Louise Slaughter (D-NY) today introduced legislation to provide a full scientific analysis of the potential health threats to communities affected by mountaintop mining. H.R. 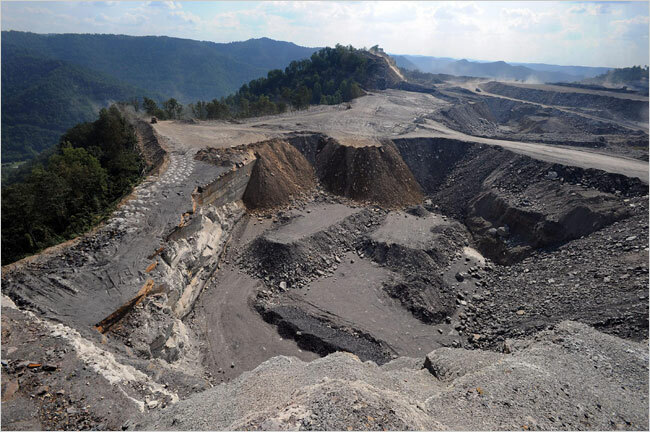 5959, The Appalachian Communities Health Emergency Act (ACHE), would also place a moratorium on new mountaintop removal coal mines and expansion of existing mines until the science demonstrates the mines will not cost local families their lives or their health. The Appalachian Communities Health Emergency Act will provide the families in these communities the answers and the protection they deserve. Mountaintop mining is a practice in which entire mountaintops are blown up in order to access a seam of coal sitting deep inside the mountain. The evidence is growing that toxic chemicals that are safely sequestered in rock inside the mountain, get released when the mountains are turned inside out. The ACHE Act will stop new mountaintop removal coal mines until the science clearly demonstrates the mines will not cost these hard working communities their health or their lives. It will also fund some of the best researchers in the world to carry out that science. The Appalachian Communities Health Emergency (ACHE) Act offers an opportunity to all House members to put differences aside and swiftly pass a bill that will protect the health and lives of the unborn. Other sponsors include: Louise Slaughter (D-NY), Lynn Woolsey (D-CA), Judy Chu (D-CA), John Yarmuth (D-KY), Michael Honda (D-CA), James Moran (D-VA), Raul Grijalva (D-AZ), Lucille Roybal-Allard (D-CA), Earl Blumenauer (D-OR), John Conyers (D-MI), Maurice Hinchey (D-NY) and Keith Ellison (D-MN). No war on coal? How many surface would be eventually put out of work during the implementation of this bill? I hope this bill will make the WV congressional delegation at least acknowledge the health studies. When they talk about “balance,” it seems that people’s health and lives are weightless. The fine folks at the med school in Blacksburg are already doing a study. Yes, those fine folks at VA Tech are working on a multi-million dollar coal funded project. They have had many coal funded projects over the years, a good old friend for the industry.